I have no idea how many times I heard this question growing up; “What’s the magic word?” Even as I write this I hear my mother’s voice. Those who teach manners call them the “five magic words,” although some of them are more than one word. What are they? Excuse me. Thank you. You’re welcome. Please. Sorry. Why are they called magic? Because of their potential power. The magic words are an easy way to create positive communication and goodwill—and it’s important for us to instill this in our children. “Excuse me” or “pardon me” are polite ways to smooth over the intrusion of your life into another’s. Sometimes, there is a need to interrupt a conversation. Sometimes we need to make our way through a blocked area. Sometimes we accidentally interrupt or inadvertently step into someone’s way. All of these faux pas are less intrusive if the words “pardon me” are attached. That magically releases you from conversations that are winding down and from lingering around a table when you need to leave. Also (and I’ll admit this is a pet peeve of mine) it’s the only polite way to ask a person to repeat something you did not hear. A terse “What?” is a word that holds no magic whatsoever. In fact, it’s somewhat rude—and none of us want our children (or ourselves) to be considered as a rude person. Many people like it when things are given to them or when a courtesy is extended their way, but if no gratitude is expressed, the giver is left to determine if the gift or gesture had any value. The simplicity of the words, “thank you” are magic because they instantaneously give back by providing positive feedback and tangible appreciation. It also increases the likelihood of more gifts and courtesies in the future—which is always a good thing. Writing thank you notes is another wonderful trait to teach our children. 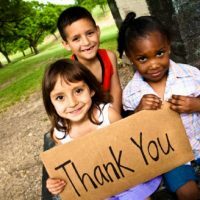 “You’re welcome” is a magic word that comes hand-in-hand with saying “thank you.” Again, it’s another way to give and continue to build goodwill. “Please” changes a demand into a request—a request that is more likely to be granted because it was done pleasantly. Nobody likes to be told what to do, but folks are usually much more cordial if asked politely. “I’m sorry” is one of the most powerful of the magic words because it can do so much. It doesn’t just show maturity and acceptance of personal responsibility, but it is the first step in re-building bridges. It can fix hurts and it is a soothing balm to an emotional wound. And many a childish argument has been wrapped up with those words. But the key to this is the awareness that it is not just for children. The parents must model it. We need to take time to point out how these words work in interactions and how the lack of these words can cause harm. My mother was in the habit of acting like we had not even spoken to her unless the appropriate magic words accompanied the statements. That was an effective way to teach me their value. The culture has set aside many of these civilities. Some of these words will be hard to remember because many social circles no longer honor their magic. But, as fathers, we must trudge on against the odds and continue to teach our children. By: Dave Trouten is the married father of two teenage boys and a Division Chair & Professor of Communication at Kingswood University.